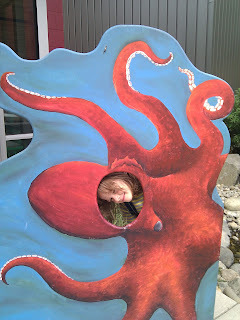 Today we headed to the Kids Discovery Museum over on Bainbridge Island. 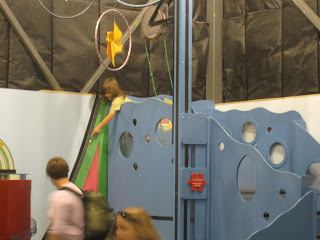 I was interested to check it out and compare it to the Seattle Children's Museum. I knew it'd likely be small and didn't have terribly high expectations going in, but admission was free today (free the first Thursday of each month) so all it would cost us was a bit of time travelling and bus and ferry fare. I had a coupon that would get Gareth on the ferry for free and even saved his bus fare home because apparently some drivers are under the impression that 6 and under ride free rather than 5 and under (and possibly because the driver understandably didn't want to take the time to add in a youth fare when there was a long line of people waiting to board). So aside from time, this was a somewhat inexpensive venture for us. 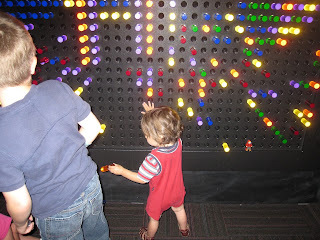 Turns out, despite its small size, that it's way better than the Children's Museum. 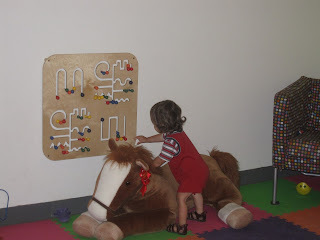 We went to the Children's Museum last summer and I was quite disappointed by the use of the space. It seemed activities were rather sparse and a fair amount of what was there was broken. Considering you pay $8.25 per person to get in, I really felt stations should have been better maintained and have a little more to them. Maybe we caught them at a bad time and they were working on putting some new stuff in or something and it's better now, but it was bad enough when we went that I'm not willing to go back and check to see if it's gotten better. Anyway, KiDiMu usually costs $6/person and does an excellent job of making the most of their small space. I was expecting it to be overcrowded because of the free admission thing, but thankfully it never felt overcrowded. A lot of kids definitely came through, but there was plenty of space for everyone who was there. 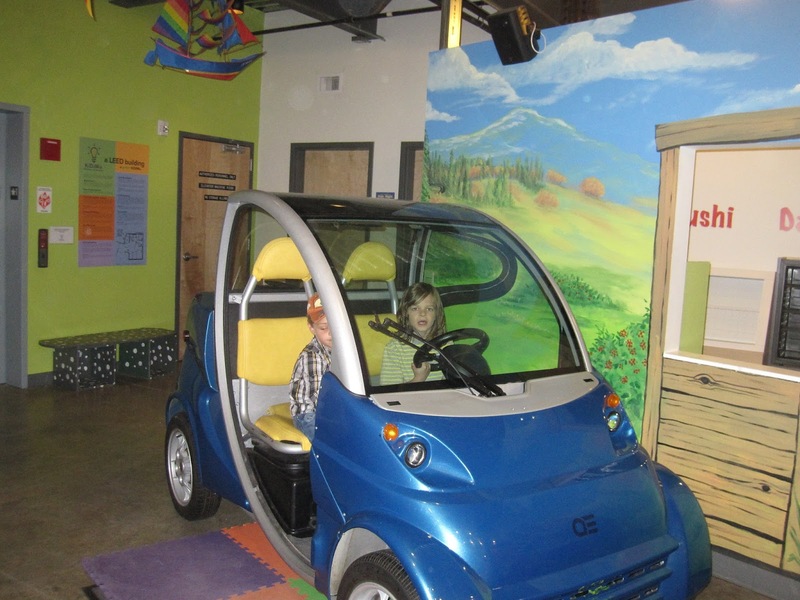 Probably helps that the museum is on Bainbridge rather than downtown! 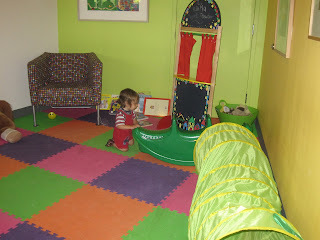 The first floor has a small tots area, which Malcolm had all to himself for the entire time he remained interested. 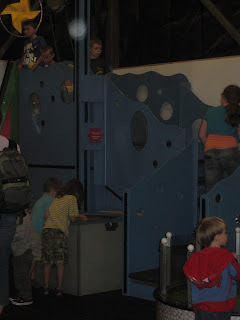 It also has a pirate ship tree house thing and areas that are a bank, grocery store, ferry boat, doctor's office, car, and a park, if I remember correctly. The upper floor has several fun activities that use golf balls - things where you can play with centripetal force and various other aspects of physics, as well as some magnets and gears. 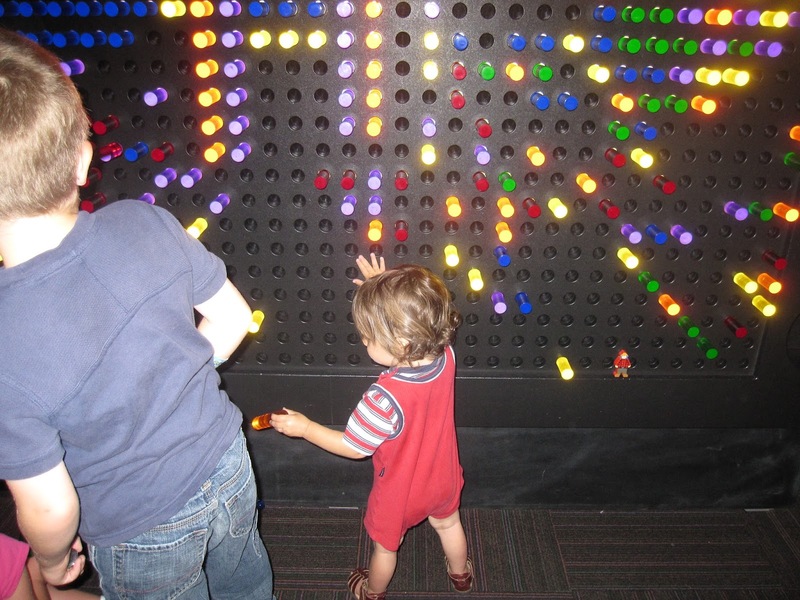 There's also a train table and a large Lite-Brite type thing. Off of the first floor there is a very small outdoor area that has a water table and bubbles and a play ferry boat plus a couple of picnic tables. The outdoor area is nothing amazing, but convenient for feeding kids a snack. Gareth could have stayed happily for hours on end, but by 3 Malcolm was quickly fading, having had zero nap time, so we headed back to the ferry terminal. 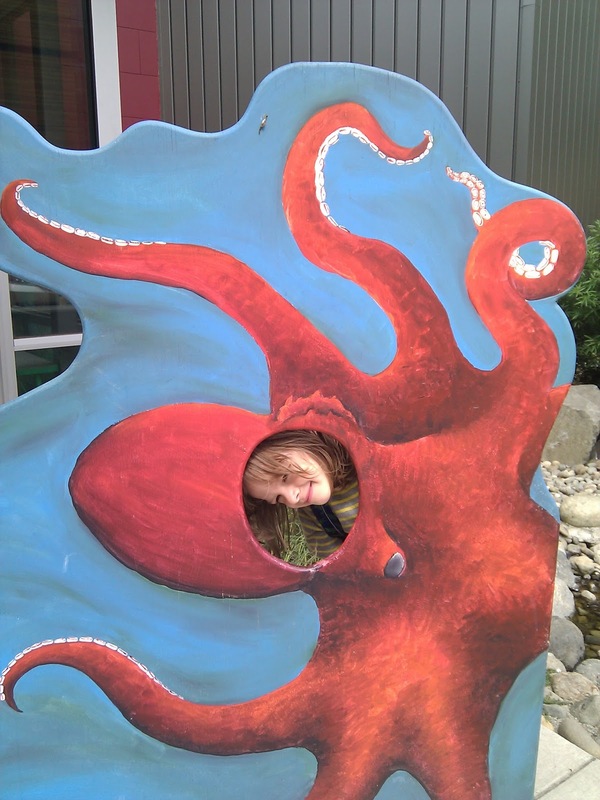 We snapped a picture of octopus Gareth on the way - surprisingly well done considering seeing my phone screen is impossible outdoors. Malcolm fell asleep on the couple minute walk to the ferry and stayed asleep for most of the ride back. He really didn't want to wake up, so was pretty grumpy for the rest of the ride and struggled a bit on the bus ride home. Despite how great the outing was, it's not likely to be repeated often. The travel is quite wearing - we left the house around 11 am and took two buses to get to the ferry terminal just in time to catch the 12:20 ferry, which got us to Bainbridge around 1pm. We probably left the museum around 3:15, caught a 3:50 ferry and then took an express bus home (crowded). This particular bus dropped us about 8 blocks from home, so we had to walk a bit (we could've waited a few extra minutes for the express that would drop us a block from home, but Gareth wanted to ride with his friend) after the bus and got home just after 5:30. So, yeah, about two hours each way for a couple hours on the island. Ryan has yet to take the ferry to any of the local islands and I would like to check out Bloedel Reserve, so we'll have to go again at some point. But that trip will require the car (more expensive, and you have to pay both ways on the ferry), so we'll have to get some other must-see Bainbridge tips from my friend Alanna and make a day of it so it'll be worth the cost and travel time. Anyway, glad we went today, but I just don't see myself doing this often. Um, since I didn't even know about this museum, I might not be a very good tour guide! And that ferry ride makes for a VERY long day with kids! That's why I rarely see any of my Seattle peeps, even when I'm there. By the time I visit my Grandma on the Seattle side, I've made that trip about as much as my kids can handle! BUT. I do have a few suggestions of places that are worth seeing on the Island. Try camping at Fay Bainbridge State Park. It's right on the beach (um, the rocky/somewhat sandy beach) with lots of driftwood that's perfect for jumping around on. And then, while you're there with a car, go see the Bloedel Reserve (or go without your kids some time, if you can find babysitting for long enough). 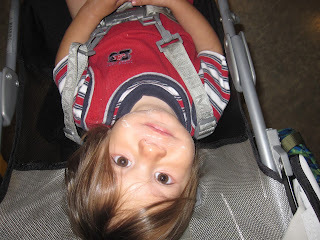 Take your kids to Battle Point Park, and also for a walk in the Grand Forest right close by. And then eat dinner at Sawatdy, my favorite Thai food place! Those are a few of my favorites! Breakfast at the Streamliner Diner, right in Winslow, is awfully nice, too!